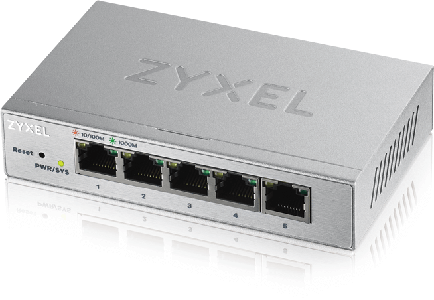 The Zyxel GS1200-5/GS1200-8 Web Managed Gigabit Switch provides simple control for better management. Unlike other advanced but complex managed switches, the GS1200 series switch is suitable for most users and provides an affordable solution with essential features including VLAN, QoS, IGMP snooping v1/v2 and v3 compatible, link aggregation, and port mirroring. The Zyxel GS1200-5/GS1200-8 does not require any additional software. It is easy, friendly, and more intuitive with its Web GUI which helps configuration tasks be completed in just a few simple clicks. Simplified for small office users’ network. Optimized multicast performance, useful for bandwidthintensive IP multicast applications such as online media streaming and time sensitive applications. Separating traffic within a business such as isolating resources between network administrators, general users, or between employees and public guest users. Provide different priorities to different applications or users to guarantee a certain level of performance for maximum data efficiency of your network. Combine two physical ports’ performance to make a single high-bandwidth data path, for faster file transfer and enhanced connection reliability. Download the Zyxel GS1200-5/GS1200-8 Datasheet (PDF).